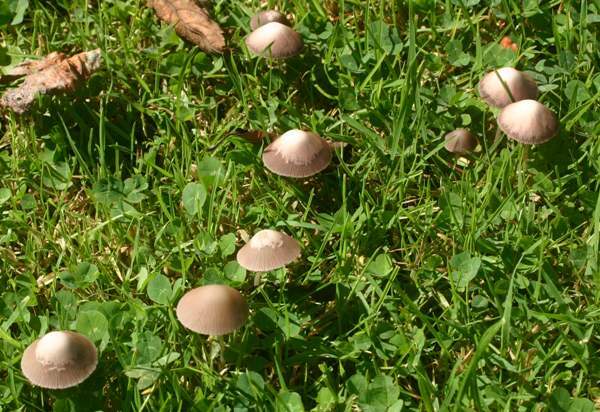 The hygrophanous nature of the cap means that colour is not a significant identifying feature; some caps may be dark brown while others, in drier parts of the same lawn, may be a pale creamy-beige that appears white in bright sunlight. 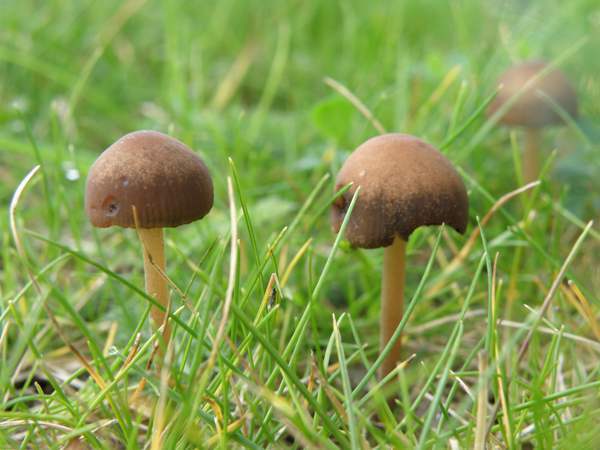 Brown Mottlegill fungi occur in most parts of the world. They are very common and widespread throughout Britain and Ireland as well as on mainland Europe and in North America. This species was described in 1800 by Christiaan Hendrick Persoon, who named it Agaricus panaeolinia (at a time when most gilled fungi were initially placed in the Agaricus genus, since largely distributed across many newer genera). French botanist and mycologist René Charles Joseph Ernest Maire (1878-1949) transferred the Brown Mottlegill to its present genus in 1933. Panaeolina foenisecii is the type species of the Panaeolina genus, which contains very few species (and only this one in Britain). Down the ages this ubiquitous little brown mushroom has acquired many synonyms including Agaricus foenisecii Pers., Prunulus foenisecii (Pers.) Gray, Psilocybe foenisecii Pers.) Quél., Psathyra foenisecii (Pers.) G. Bertrand, Panaeolus foenisecii (Pers.) Kühner, and Psathyrella foenisecii (Pers.) A.H. Sm. Panaeolina, the genus name of this little brown mushroom, suggests that this species has similarities with those in the genus Panaeolus. 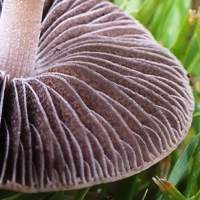 Panaeolus means variegated - and indeed the caps of many Panaeolus species are zoned, but the generic name is not a reference to the cap colouring but to the mottled or variegated colouring of the gills. The mottling on the gills of Panaeolina foenisecii is illustrated on the left; this effect is due to patches of spores of different parts of the gill surface reaching maturity at different times. 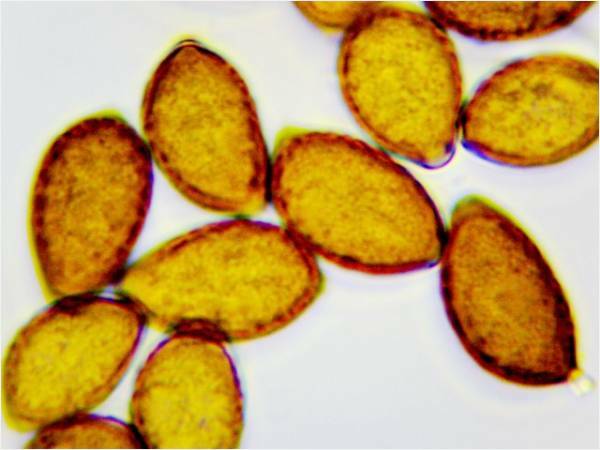 One other obvious difference between fungi in these two genera can be seen provided you have access to a high-powered microscope: you will see that the spores of Panaeolus fungi are smooth while those of Panaeolinus are minutely roughened. The specific epithet foenisecii simply refers to haymaking. 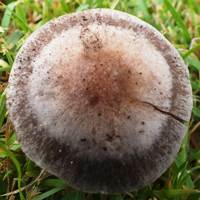 1 to 2cm across, caps are initially bell-shaped or conical, expanding to become broadly convex; hygrophanous, medium to dark brown when moist, drying from the centre outwards to a creamy-beige. Gills of Panaeolina foenisecii are adnate; pale brown at first becoming mottled dark brown. Stems of the Brown Mottlegill are 4 to 7cm long and 3 to 5mm diameter; cream flushed towards base with mid brown; cylindrical; finely fibrillose; no stem ring. Lemon shaped with a roughened surface and a germ pore (see picture, left). Dimension range 11-18 x 6-9µm. Odour is slightly unpleasant but not diagnostically distinctive. 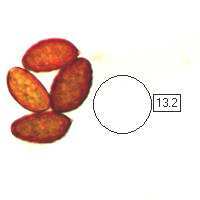 Saprobic, on lawns, roadside verges and other grassy places. April to December in Britain and Ireland. 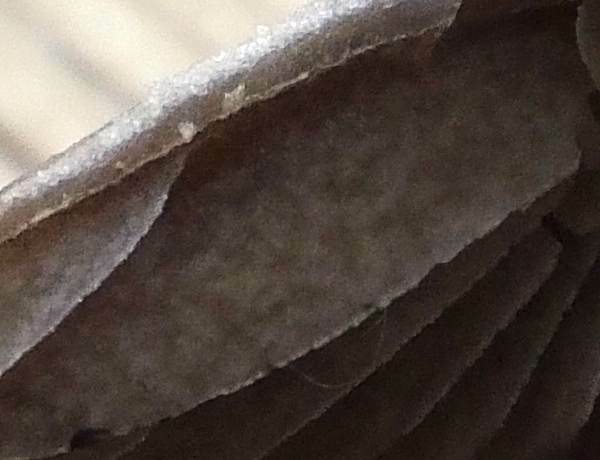 Stropharia semiglobata, the Dung Roundhead, has a transient ring and leaves a brown spore print. 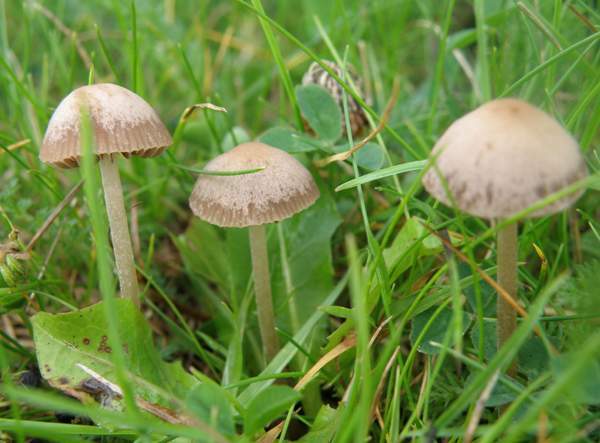 Panaeolus fimicola, the Turf Mottlegill, has a dark-brown cap when wet and dries out to become mid brown.